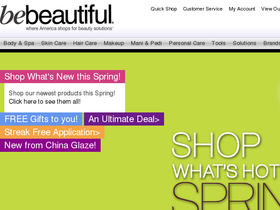 Be Beautiful, online at bebeautiful.com, is an online retailer of beauty products. Be Beautiful offers a wide range of beauty solutions for every beauty need. Among the selection find things such as body and spa treatments, skin care, hair care, makeup, mani and pedi supplies, personal care, tools and much more. Be Beautiful offers the best brands including allegra, Essie, Be Natural, Maxim, Pinnacle, Seche, Robanda and much more. So when in need of some new beauty products be sure to stop by Be Beautiful to see what they have for you. But first, checkout RetailSteal for incredible Be Beautiful promotions, Be Beautiful discounts, and Be Beautiful coupon codes. Orders over $49 on Be Beautiful ship for free. Available shipping methods include standard, 2 day, and next day at an additional charge. International shipping is not available. See website for full details, exclusions may apply. Spend $49 or more at Be Beautiful and enjoy free shipping on your entire order. Enjoy a 10% discount on your purchase from Be Beautiful. Click link to shop and use coupon code to save. Spend $25 or more on your order from Be Beautiful and use this coupon code to save $5. Shop the outlet at Be Beautiful and find select products at up to 75% off.